Demand for free range chicken is soaring in Australia. For good reason, big companies now want in on the action. But instead of raising their standards to meet our expectations, the biggest chicken producers in the country now want permission to change the definition of 'free range' so they can cram more than 140,000 birds into one hectare. The Australian Poultry Industries Association (APIA) represents the country's biggest chicken meat producers, and they're asking the ACCC to allow them to use the label "free range" for chickens that, in reality, are restricted to an area the size of an A4 piece of paper. Sound wrong to you? 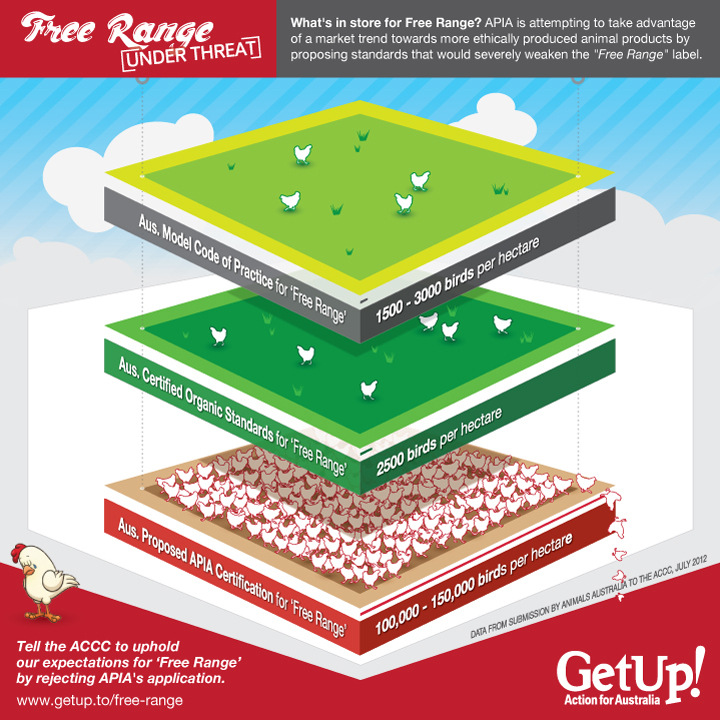 Write to the ACCC and ask them to defend the "free range" label. The ACCC has granted GetUp members an extension to the submission deadline until the end of the day 10 August. Looking for more details on what to write? Read GetUp's submission to the ACCC here, or check out the tips below. Support for a sustainable free range meat industry is soaring. This is great, but it means that consumers should be clear about what 'free range' means. Deceptive labelling, in an already muddled and ambiguous landscape, will disappoint consumers who expect higher standards. Not so free to roam: if approved, the standards would allow "free range" chickens to be housed at more than 140,000 birds per hectare - that's one A4 sized piece of paper per chicken. The trademark registration of the proposed Australian Poultry Industries Association (APIA) Free Range Certification Program could mean that products produced in these standards could be called "free range". The ACCC needs to protect the definition of 'free range' and not allow what is an already confusing and imperfect method of labelling to be further weakened.